Canada won't change its decision not to sign on to a second phase of the Kyoto Protocol, despite concessions by China, Environment Minister Peter Kent said Monday. China's concession to start cutting its greenhouse gas emissions won't change Canada's decision not to sign on to a second phase of the Kyoto Protocol, Environment Minister Peter Kent said Monday. 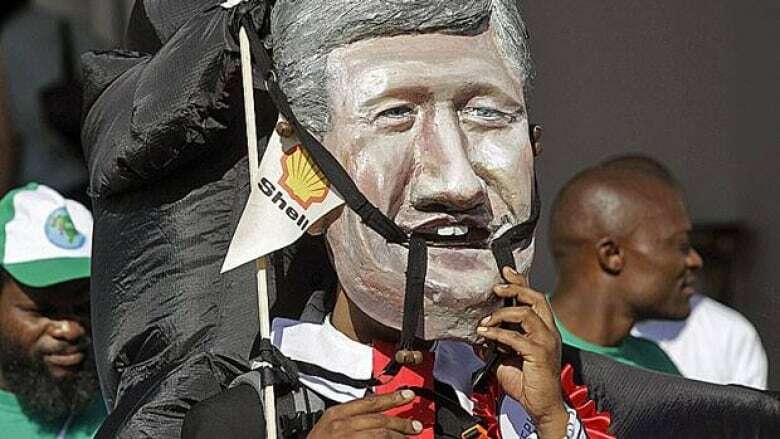 Canadian officials have repeatedly said any new agreement must include all major emitters. Countries with emerging economies, such as China, India and South Africa, argued commitments to cut emissions would limit their economic growth and were a challenge developed countries didn't face as they grew to become powerhouses. Kent, speaking at the UN's climate change conference in Durban, South Africa, said he wants more details on China's willingness to cut its greenhouse gas emissions in 2020. "We haven't seen any detail yet. We look forward to China bringing its proposal to the conference," Kent said. "But with regards to Canada not taking on a second Kyoto commitment period, that would not change our position." Canada's chief negotiator says China's willingness to cut its greenhouse gas emissions is "interesting." Guy Saint-Jacques, Canada's chief negotiator, said news that China may commit to cutting its greenhouse gas emissions starting in 2020 is an important development. "Well, I think it's an interesting development, but I wish they will bring this formally to the negotiating process because we have not seen any details — and you know the devil is in the details. China is a very important emitter," Saint-Jacques said. "So far this year, in all their negotiating sessions, they have basically refused to live by the commitments in Cancun agreements of last year. So it could be an important development that could help to move the process, and we will certainly study it with a lot of attention." The talks in Cancun last year ended with modest agreements on preventing deforestation and supports for developing nations but deferred the more difficult work on cutting carbon emissions to the Durban meeting. Representatives from 194 countries around the world are in Durban for talks on an agreement to follow up the 1997 Kyoto Protocol. NDP environment critic Megan Leslie called China's willingness to enter into a legally binding agreement a breakthrough. "The argument that China isn’t doing anything, well, that’s gone. And I’m left to ask what is Canada’s excuse now," she said. There's a lot of opportunity to work on Kyoto 2, Leslie said, but the government is trying to sabotage efforts. While no one can be certain China's offer is sincere, she said, climate change is too important to ignore it. "I like to look at things optimistically. I like to see it as an olive branch. Time will tell whether it was sincere or not, but I think we have to seize on every opening we can possibly seize. Every hand that is extended, we need to take that hand," Leslie said. In question period, Canadian Heritage Minister James Moore said the NDP's plan would implement a carbon tax that would punish Canadian consumers and wouldn't have the intended effect. "The Kyoto Protocol simply doesn't work," Moore said. "It only contains 27 per cent of the world's emitters of greenhouse gases. What the Canadians have asked for and what our government has led on is a true global effort to fight what is a true global problem." The linchpins of a new deal are China and the United States – and both set hard conditions. During the first week of the conference, attention honed in on China, and whether it was signalling new flexibility or reframing known positions. China's top climate negotiator Xie Zenhua, in his first meeting with reporters, said China wanted to ensure all previous commitments by the industrial countries were met before entering into the next phase. If that happened, he said, China could discuss a post-2020 deal. "The framework, I think, should be a legally binding one, or some documents to that effect." But Xie set several "preconditions," including an extension of the Kyoto commitments for industrial countries, honouring commitments on immediate and long-term financial aid to poor countries, and delivery on promises of new technologies to develop low-carbon economies. U.S. envoy Todd Stern said the United States has no objection to a post-2020 treaty, as long as it treats everyone the same. Countries must accept "obligations and commitments that have the same legal force," Stern said. But he did not believe that China and others were prepared to unconditionally accept legal parity with everyone else. There's a week of negotiations left, but Canada's position is at odds with China's. Kent repeated the Canadian government's objection to extending the Kyoto Protocol. "Canada has made clear this year that Canada will not make a commitment to a second Kyoto period," he said. "Our fixation — our commitment — is on Copenhagen and the Cancun agreement. We believe that ultimately a new agreement that includes all of the world's major emitters in both the developing and the developed world is the only way to materially reduce annual megatonnage to the point that we can work to prevent global warming hitting or exceeding two … degrees." While Canada hasn't formally withdrawn from Kyoto, its current commitment to cutting harmful emissions is much lower than required to hit the targets agreed to under that deal. The government says it will cut greenhouse gas emissions by 17 per cent from 2005 levels by 2020, while the previous government agreed to cut emissions by six per cent from 1990 levels. Emissions rose by 24 per cent between 1990 and 2008, according to the Conference Board of Canada.